Last weekend it was certainly very hot and humid here in Iowa. Typical summer weather for us, except it always waits to do this sort of thing after the kids are in school and the pools have all closed for the season. Go figure! But hey, we're just used to it. I really had no plan to do any sort of baking, but we had some big zucchinis on our table that needed used up. Oh and one lone can of pumpkin in my pantry. These were a total experiment and I'm so glad I decided to take a chance on them. 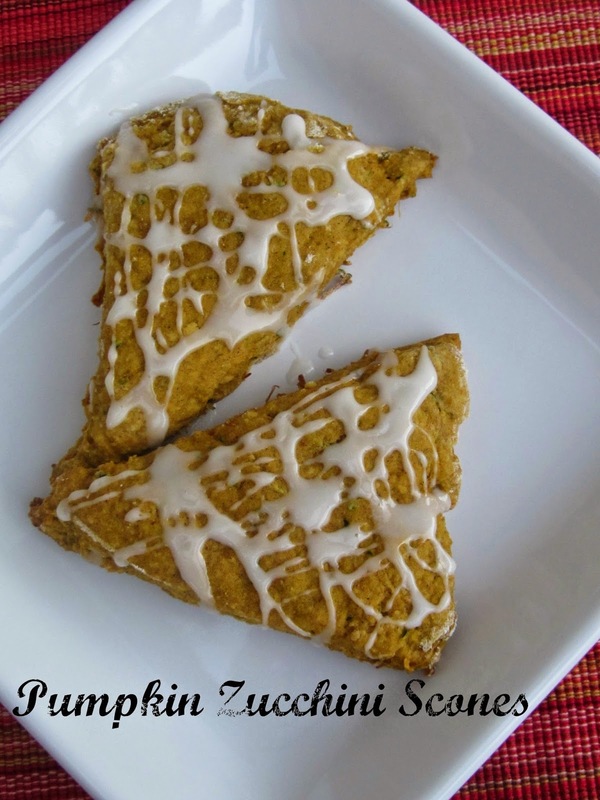 Made with whole wheat flour, pumpkin, zucchini and sweetened only with a bit of honey; I'd say they make for a pretty healthy breakfast option. Since they aren't very sweet I did spruce them up with a little icing drizzle, but you can leave that off if you wish. Honestly, I wasn't sure what the kids would think of these. Sometimes they don't like my new creations. They surprised me though and kept coming back for more. I froze half of the batch and left the other half on the counter, the container was gone within a day. That tells me they're a keeper! In a large bowl, combine egg yolk, honey, vanilla, zucchini, pumpkin and buttermilk. Mix together well. In another bowl, combine all dry ingredients. Using a pastry blender, cut in butter until mixture is crumbly. Then add wet ingredients into the dry and mix just until combined. Turn dough onto a lightly flour surface and knead a few times. Add a little bit of flour in if needed. Using a rolling pin, roll dough into a large circle or make into two circles if needed. Cut into wedges. I made some of mine smaller for the kids. You should get about 18. Place scones onto a baking sheet that's been lined with a silicone baking mat or parchment paper. Bake at 350 degrees for 20 minutes or until turning golden brown. Remove from oven to let cool. To make icing: combine all ingredients into a bowl and mix well. Drizzle icing immediately over the scones. These also freeze well, flash freeze on a baking sheet before placing in a freezer bag. Thaw and reheat when ready to enjoy.